Beginners new to marquetry will really appreciate this latest disc in the Marquetry Society "Training DVD" catalogue. Rosebowl winning marquetarian Peter White takes beginners new to the art of marquetry through all the procedures required to complete a standard commercially available marquetry kit picture. 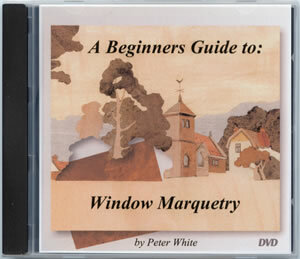 The picture chosen for this tutorial DVD is from the starter to mid level grade of marquetry subjects. 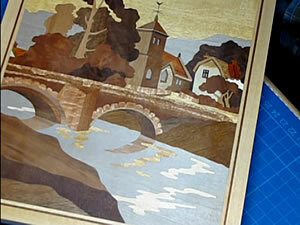 'A Beginners Guide to Window Marquetry' is a complete tutorial for beginners using a craft kit to demonstrate techniques and methods of working required to make a picture from start to finish. The DVD includes some advanced tips and techniques. The tutorial lasts for over 2 hours and consists of eight chapters covering the following topics, (being in menu sequence); 1~ Introduction, 2~ Tools and Equipment, 3~ The Test Piece, 4~ Cutting the Picture, 5~ Gluing Up, 6~ Applying the Borders, 7~ Sanding and Finishing, 8~ Information. 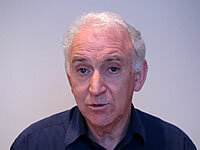 The screen shot seen here is taken from Peter's introduction to the stages of the Beginners Course as found on this DVD. 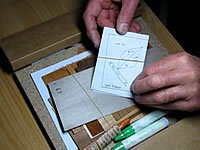 What you see here are the contents to be found in your marquetry kit box. 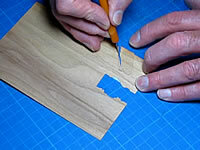 It may look daunting at first, especially if you haven't done any marquetry before. But, as Peter will show you, it is actually a good deal easier to do than you first thought! 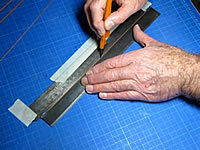 Here you see Peter guiding you through the start of your marquetry career with a test of your cutting skills. This is achieved by transferring a test design to a small waster veneer, then cutting your design out with the supplied cutting knife. This further stage in the kit build covers the more intricate steps of selecting grain patterns for depicting trees in the main picture, and then cutting them out from the veneer without splitting or breaking the veneer. Once Peter has shown you how, it is very easy! 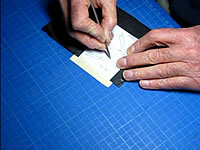 Here you see Peter guide you through the process of cutting and fitting your very own stringers. Once you know this technique, you will never need to buy commercially made stringers and borders again! You probably thought it would be difficult, but not here! 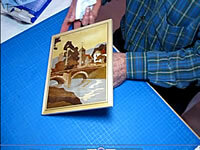 And here we see Peter applying a coat of finish to the completed marquetry kit picture. The beauty of the supplied veneers makes a wonderful picture which you can well and truly be proud to say "I made that". If you are a beginner, you will thoroughly enjoy this DVD. For information on how to purchase this DVD: "Click Here"